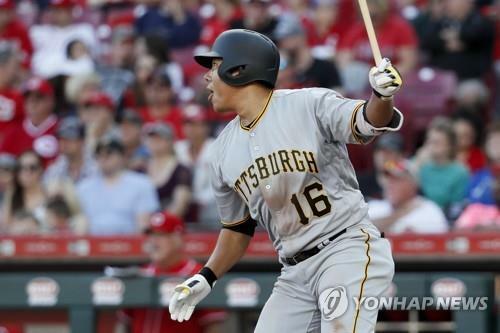 SEOUL, Nov. 9 (Yonhap) — The Pittsburgh Pirates have re-signed South Korean infielder Kang Jung-ho, barely a week after making him a free agent. The club announced on Thursday (local time) that they inked Kang to a one-year deal, reportedly worth US$3 million, plus $2.5 million in performance bonuses. On Oct. 31, the Pirates declined to pick up Kang’s $5.5 million option, after his four-year, $11 million contract expired. Kang was free to explore the open market, though the Pirates were widely expected to sign him for another go. In Kang’s absence this past regular season, rookie Colin Moran served as the primary third baseman. Moran batted .277/.340/.407 with 11 homers and 58 RBIs in 144 games — solid numbers but without the kind of power that Kang displayed in his first two seasons.